By analyzing this data we have found that almost without exception when a Union is organizing in a specific city or region there are numerous petitions filed at other employers in the area. What this has shown us is if other employers had been aware of the organizing taking place in their area they could have immediately started a “card mitigation” process that could have prevented or stopped the card signing. FREQUENCY OF SERVICE: For many of our clients, the demand has typically been to receive reports of union organizing activity on a monthly basis. This report would be sent to you electronically via email PDF attachment. In rare instances we have been asked to provide the report weekly (minor cost difference). Last, some have asked to receive the information daily. A daily submission of all known formal petition activity can be accomplished through a separate product called Daily Petition Subscription Service. However, for most, monthly is sufficient. CUSTOM TAILORED REPORTING: More importantly, we can custom tailor the report to such activity which is pertinent to your business operation (by industry, location, or specific union opposition). 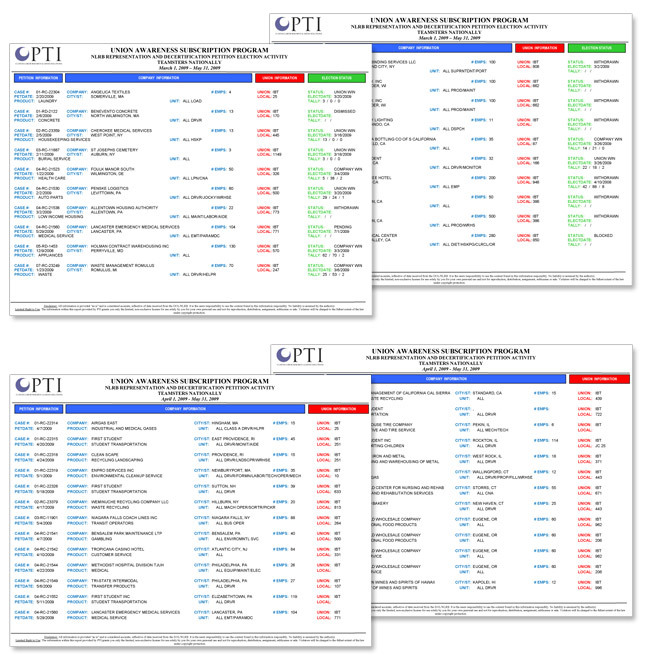 SOURCE OF DATA: For nearly 3 decades, PTI has established a working relationship with every regional and resident NLRB office across the country. In addition, we have a routine protocol through subcontract local data collectors to retrieve all available private sector NLRB petition and election activity in response to our standard FOIA (Freedom of Information Act) requests. This information is typically acquired daily. However in some cases, based on the individual NLRB Regional Director’s discretion, the information may not be readily available for a number of days. Regardless, maintaining knowledge of such information is critical in determining ones vulnerability to union intervention. 1. Geographic Scope: Individual Localized area of concern or nationally. 1. Monthly Detailed Report of all NLRB Petition Filings (RC/RD Petitions) for the past 60 days. 2. Monthly Detailed Report of all captured NLRB Election Dispositions (Election Results, Withdrawn, Dismissed, Transferred) for the past 90 days. Campaign Websites reinforce your campaign message in a format that preserves employee anonymity.